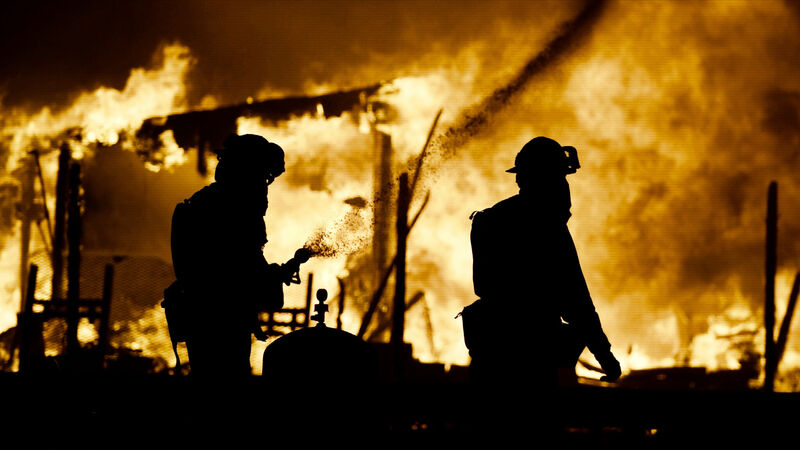 Firefighters douse flames as a home burns in the Napa wine region in California on Oct. 9, 2017, as multiple wind-driven fires whip through the region. What is wrong with the weather? Is it really climate change? Are hurricanes, tornadoes, earthquakes, floods and forest fires really “natural”? Why are these once-in-a-lifetime, where-did-this-come-from, never-before-witnessed calamities piling up on top of one another? The number of natural disasters is measurably rising. The nonprofit Borgen Project found that the average number of natural disasters reported in 1970 was 78. During the 1990s, that number was 354 disasters a year, according to the Red Cross. Between 2000 and 2004, that number jumped to 728 natural disasters per year, and then the number decreased slightly since. However, the severity and the cost of these disasters have continued to rise. “Unprecedented” and “record” disasters are happening at a quickening pace. “History making” events are becoming commonplace. Such catastrophes should challenge our thinking. They force us to contemplate the fragility of man. They demand that we consider some of the deeper questions that we all-too-easily ignore in more prosperous and peaceful times. Scientists are searching for explanations within the natural world itself, particularly as disasters increase in frequency and lethality. Why are disasters getting deadlier? Many scientists point to climate change. To account for every climate-related disaster—damaging cold fronts, freakish blizzards, flooding rains, hurricanes, and a host of other dangers—many of them blame greenhouse gases, which enter Earth’s atmosphere due to human activity like deforestation, raising livestock and burning fossil fuels. The lesson they draw is that if human beings would stop producing carbon dioxide, natural disasters would decrease. Evidence does indicate that smog from industrial activity; smoke from slash-and-burn deforestation in developing countries; widespread replacement of green and open land surfaces by pavement, asphalt and buildings; and the exhaust of jets, cars, trucks, trains and ships have contributed to slight changes in the global climate. But are these factors responsible for all the unprecedented calamities around us? Some scientists question the theory of man-made climate change. They point to instances of other scientists actually changing data in their climate models to fit their theory. They argue that the climate-change doctrine is based on ideology more than on conclusive scientific evidence. This is a hot-button issue clouded by politics—and by a considerable amount of conflicting information. Meteorologists do not know the extent to which climatic changes or variability may be accurately predicted in the long term, nor do they understand the reasons behind shifts in major global-impacting weather forces, such as high-altitude jet streams or ocean currents. Weather experts are only able to rely on scientific observation, experimentation and reason—physical evidence—to forecast weather in the short term. And the atmosphere’s size, interconnectivity and complexity has so far proven too great for scientists to sufficiently understand. Yet there is even more to the story. The full story goes far beyond the possibility of man-made climate change due to carbon-dioxide emissions. The atoms that compose our planet and its atmosphere did not make themselves. The water moving from the oceans to the clouds to the rivers and back to the oceans did not design its own cycle. The soil did not formulate its own mixture of minerals and organic matter to support hundreds of thousands of plant species, which live, thrive and decay, enriching the soil from which they sprouted. The birds did not design their own wings; marine animals did not design their own fins. The climate did not chart its own ocean currents; constitute its own formulas of gasses; crank up its own Coriolis Effect; project its own radiation- and meteor-absorbing layer; balance its own cool and hot, wet and dry, high- and low-pressure systems; design its own greenhouse effect; and form its community of plants and animals all for the purpose of shielding, sustaining and protecting the fragile little life forms below. These designs were designed. This creation was created. That means there is a Designer—a Being with immense intelligence, creativity and power. The God who created the heavens and the Earth, the ocean currents and the jet streams, the cloud formations and the mountain ranges, the latitudinal variations, and the ecosystem types, still controls those creations. He has the power to send gentle rains in due season as a blessing or torrential floods as a curse. In fact, He even promises to send fair weather as a blessing to nations that obey His law and to send weather disasters on nations that disobey. God allows mankind to reap the consequences of pollution and other physical sins. But He also intervenes in the weather to punish mankind for its spiritual sins. The Bible reveals that great weather upsets and increasing natural disasters will occur in our time. That is why the Trumpet watches increasing natural and weather-related disasters so closely. Residential neighborhoods near Interstate 10 sit in floodwater in the wake of Hurricane Harvey on Aug. 29, 2017, in Houston, Texas. An area in Wynnewood, Oklahoma, lies devastated after being hit by a large tornado in May 2016. People walk on Pennsylvania Avenue in near whiteout conditions in Washington on Jan. 23, 2016. Not long ago, even intellectuals looked at nature and could not help but see God. “I love to think of nature as an unlimited broadcasting station, through which God speaks to us every hour, if we will only tune in,” wrote George Washington Carver, the distinguished 20th-century scientist. Ralph Waldo Emerson believed that “the glory of the omnipresent God bursts through everywhere” in nature. A connection with nature tends to point us back to our world’s masterful Maker. The earliest chapters of the Bible depict God creating the oceans and landmasses, the atmosphere and weather patterns, the various species of plants and animals, the ecosystems—and the vast host of laws that govern nature’s successful operation. These chapters describe God constructing the complex machine by which He would sustain mankind. God designed the oceanic and atmospheric systems that govern the Earth’s climate, and He alone fully understands how they work and how they can be controlled. The Bible teaches that not only is nature the creation of God’s mind, it is, in fact, a vital instrument through which He communicates with us. “For the invisible things of him from the creation of the world are clearly seen, being understood by the things that are made, even his eternal power and Godhead; so that they are without excuse” (Romans 1:20). This book—which most people have on their bookshelf, but few understand—gives us information that the best scientific instruments and guesswork simply cannot provide. Today, any person bold enough to consider nature God’s “unlimited broadcasting station” is mocked as a religious crackpot. But the Bible boldly claims to pinpoint the causes of weather cataclysms and to forecast long-term weather trends. In Matthew 24, Jesus Christ was asked by His disciples about what signs would precede His Second Coming and the end of this present world. He responded with the pivotal prophecy of His earthly ministry: the Olivet prophecy. Every end-time Bible prophecy revolves around the events He forecast here. A red-letter Bible shows that these are all Christ’s own words. This is the first warning Christ gave. It is the major warning sign we need to look out for. He warned that people would come in Christ’s name, but they wouldn’t believe Christ’s message. And He said that these false ministers would deceive many. The faithless approach that most religious leaders take in responding to natural disasters is certainly a fulfillment of this prophecy! Christ continued by giving another important sign of the end time: weather patterns and other natural phenomena taking a violent turn for the worse. “And ye shall hear of wars and rumours of wars …. For nation shall rise against nation, and kingdom against kingdom: and there shall be famines, and pestilences, and earthquakes, in divers [different] places” (verses 6-7). Notice, in addition to the “wars and rumours of wars”—surely an apt description of the current state of international relations—Jesus told His disciples that His return would be preceded by an uptick in natural disasters. Luke’s account of the same prophecy reads, “And great earthquakes shall be in divers places, and famines, and pestilences; and fearful sights and great signs shall there be from heaven” (Luke 21:11). Christ stated specifically that before His return there would be earthquakes in different places. It is true that there have always been earthquakes. But for Christ to give this as a sign of the imminence of His return tells you that we should watch for a change from the norm—a notable, measurable increase in the frequency and ferocity of quakes, and perhaps they’re occurring in unexpected places. What a mistake it would be, then, to dismiss the fact that this is exactly what we are seeing today. In the very next verse, Christ tells us, “All these are the beginning of sorrows” (Matthew 24:8). This is the point at which we find ourselves today. Christ told us it is only the beginning of sorrows! The disasters occurring before our eyes are just the beginning. They are going to get much worse. There will always be people insisting that we are in no special danger today. They say, We’ve always had storms and disasters. We’ve always bounced back. We’ve always rebuilt. They say that there is no Creator, just the random senseless and tragic outbursts of “Mother Nature” going about its mindless course. Still others say a loving God would not allow people to suffer, therefore these environmental disasters prove God is either not loving, not aware or not powerful. None of these explanations agree with the truth of the Bible! Here is how God responds to the scoffers: “But evil men and seducers shall wax worse and worse, deceiving, and being deceived” (2 Timothy 3:13). As evil worsens, so does God’s punishment. Paul is addressing those of us living in the last days. “This know also, that in the last days perilous [or dangerous] times shall come” (verse 1). People deceive themselves by thinking there is no special danger right now—that the world has always been like this. These are not normal times. The Bible says that earthquakes, droughts, floods, tornadoes, hurricanes and tsunamis are anything but normal. Whether they happened in the past or are happening now, they are curses man has brought upon himself as a result of disobedience to God’s laws. And the Bible says that, in the modern nations of Israel, these curses are about to explode—they are about to get so bad that they will legitimately be compared to the events described in the pages of the Holy Bible. In fact, some of them are events described in the pages of the Bible! The Bible says that earthquakes, droughts, floods, tornadoes, hurricanes and tsunamis are anything but normal. Whether they happened in the past or are happening now, they are curses man has brought upon himself as a result of disobedience to God’s laws. God is giving advance news of the storm that will soon strike all of America, Britain, and the Jewish nation in the Middle East—just like meteorologists warn about hurricanes before they strike. He is enabling residents in the path of the disaster to take preparatory action. What about you? Will you discern the signs of the times? Will you heed Jesus Christ’s warning? Or ignore it? The God of the Bible is indeed all-powerful, all-knowing and all-loving. He promises to bless people for obedience and curse them for disobedience. In Leviticus 26:3-4, God says, “If ye walk in my statutes, and keep my commandments, and do them; Then I will give you rain in due season, and the land shall yield her increase, and the trees of the field shall yield their fruit.” Are the cities that are being deluged with floods, or those that are languishing in drought, receiving this blessing? Why not? If you believe the God of the Bible, you know that droughts, floods and other disasters are curses for disobedience. The solution to such curses is repentance. For our land to be healed, we must understand these promises. 2 Chronicles 7:13-14 say, “If I shut up heaven that there be no rain, or if I command the locusts to devour the land, or if I send pestilence among my people; If my people, which are called by my name, shall humble themselves, and pray, and seek my face, and turn from their wicked ways; then will I hear from heaven, and will forgive their sin, and will heal their land.” That is an absolute promise. If we turn from our wicked ways, God will forgive our sin and heal our land. This is a powerful scripture from the living God telling us how to solve our problems. The earthquakes and other natural disasters that precede Christ’s Second Coming are evidence of just how far from God mankind has turned. These environmental disasters are God’s punishment, not for revenge, but so that the tiny life forms on this planet will see their own puniness, turn from their wicked ways, and seek their Creator. We ought to be very attentive to God’s warning. When you see such horrific problems like city-destroying hurricanes, you have to ask yourself, Is God blessing mankind? Religious people often pray for God to heal their land. But is God hearing those prayers? Is He healing our land? Are we missing something? After five years of drought, massive rainstorms hit parts of northern California, causing the Oroville Dam spillway to overflow on Feb. 11, 2017. In some areas, what seemed to be a long-withheld blessing became a curse. This is an apt description of the world’s climate today. Some regions are experiencing record flooding as other areas experience record drought. This is because these weather disasters are divine curses being sent on mankind to prepare them for the return of Christ. When Jesus Christ finally comes, everyone on Earth will have seen the futility of trying to decide what is good and what is evil apart from God and His law. They will recognize the curses that have come as a result, and will be ready to repent and to turn to live the way of harmony and happiness that God offered Adam and Eve in the Garden of Eden after He had renewed the face of the Earth. That will mean the dawn of a new age. Jesus Christ will set up God’s government of love, peace and joy. With all mankind walking in God’s statutes, keeping His commandments and doing them, the promises in Leviticus 26 of “rain in due season” and that “the land shall yield her increase” will be realized all over the planet. This world will be blessed with beautiful weather and stable climates. There will be no anxiety over crop failures and famine, no fear of being killed in a severe weather event. With obedience to God will come abundance in the land. If you would like to know more about that soon-coming world, request a copy of our free booklet The Wonderful World Tomorrow—What It Will Be Like, by Herbert W. Armstrong. Finally, with God’s benevolent government in place, the hope of the resurrection will become reality, and everyone who has ever lived—including all those who have perished in the disasters and cataclysms that have afflicted our world—will be raised into a world where the right choice has been made, where, as the Prophet Isaiah said, the knowledge of God covers the Earth as the waters cover the sea. God the Father wants to fulfill His purpose in us. And when He finally does come down to Earth—when the incredible potential He has given to every human is fulfilled—everyone will understand why the Apostle Paul was inspired to write in Romans 8:18: “For I reckon that the sufferings of this present time are not worthy to be compared with the glory which shall be revealed in us”! When disasters strike, people ask why. Science simply cannot provide a complete answer. This article gives a brief summary of the Bible’s teaching about why catastrophic nature-related phenomena are forcing their way into the headlines with increasing frequency. But there is far more scriptural proof of this spiritual dimension. We would like to offer you a booklet explaining more fully the ultimate meaning and purpose behind these seemingly random disasters. 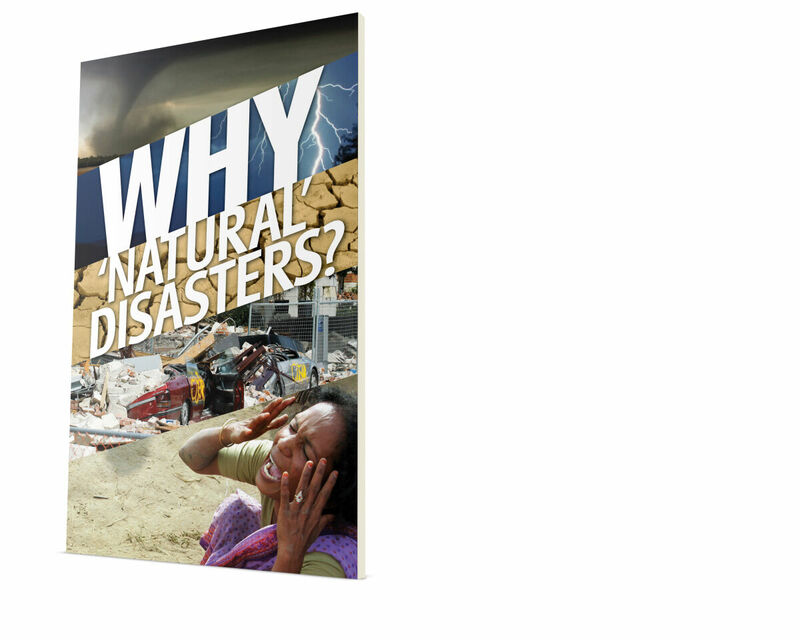 It has a chapter explaining the increasing frequency of these calamities, a chapter called “Why Does God Allow Suffering?”, another titled “Are You Ready for the End of the World?” and a final chapter built around the hope-filled, inspiring future prophesied in the Bible, called “An End to Natural Disasters!” Read online or request a free copy of our booklet Why ‘Natural’ Disasters?